Lush Fab Glam Inspired Lifestyle For The Modern Woman: Fabulous In Five Minutes: D.I.Y Ponytail Hairstyles. Fabulous In Five Minutes: D.I.Y Ponytail Hairstyles. After a weekend of sleeping in and relaxing, waking up and heading out the door for work on Monday mornings can feel like a chore. That's why we have put together 20+ fabulous hairstyle ideas to help make your mornings and getting out the house in general just a little bit easier. Add flair to your sleek ponytail with an over-sized bun and braided like 'The Best Man' actress Sanaa Lathan. Try a high braided end ponytail like actress Blake Lively. Do an elegant mini-beehive ponytail like socialite Olivia Palermo. Add a side twist to your high ponytail like actress Olga Kurylenko. Add an exaggerated beehive pouf to the front of your ponytail like actress Megan Fox. Try a high-knot braided bun hairstyle like reality TV star Kim Kardashian. Try a side-part ponytail with one side brushed flat onto your forehead and then sleeked back with loose curls as seen on the runway. 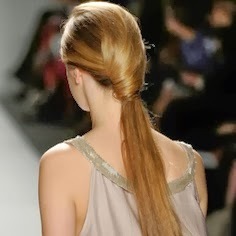 Or try a sleek middle-part part pin-straight ponytail. Tame your freshly blow dried hair by pulling it into a loose side ponytail kept together with your own hair strand. For a quick no fuss hairstyle try a middle part, side ponytail with loose strands in the front like model Alexandra Ambrosio. Get actress Dine Kruger's super sleek and straight side part ponytail. Try a low fishtail braid ponytail like actress Nina Dobrev. Get out the door in no time with a quick high top ponytail like actress Jessica Alba. Do you have oily flat hair? Turn it into a positive by trying a low, side-part ponytail with tucked-in ends like actress Natalie Portman. For an elegant look try this high, side-part ponytail, fastened with an over-sized bow with loose strands falling to the side of your face. Can't find a hairband, create a beautiful ponytail by pulling your hair back in a twist and secure it with a hair pin. Create a fresh and cute look with loosely curl strands falling to the sides of your face and a beehive pouf ponytail like 'Pretty Little Liars' actress Lucy Hale. 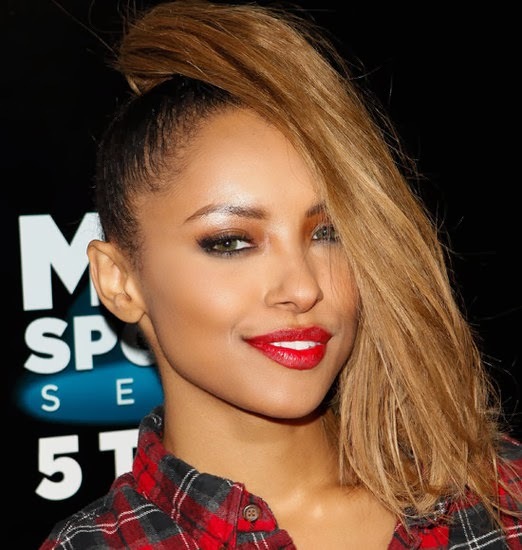 Try a fun top knot ponytail with your hair falling loose to one side like 'The Vampire Diaries' actress Kat Graham. Try a carefree tussled ponytail like actress Nina Dobrev. Get ready for a glam event by putting the upper half of your hair into a middle-part ponytail and allowing the loosely curled lower half to cascade around your shoulders like actress Paula Patoon. 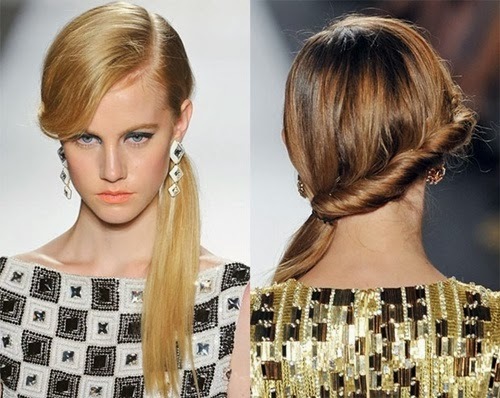 The side-part and one side twist ponytail is a glamorous looks that you should try for a fall /winter wedding or party. Look as fabulous as actress Drew Barrymore by flipping the ends of your sleek ponytail upwards. Which ponytails hairstyles will you try? Share with us by leaving a comment below. Nina Dobrev Beautiful and Pretty as a picture. Kim K With this face it embellishes any hair! Without belittling the braided beautiful!. Very beautiful with or without hair she is .... "10".